After my last post I was thinking about sending my stuff off to a render farm to get rendered and hopefully save some time, however in the end as my main computer was starting to feel a little bit lethargic, I decided to upgrade some of the parts and acquire two or three basic nodes based upon the Devil’s Canyon CPU Architecture – in this case the 4970K. So, for the main computer I purchased a Micro ATX motherboard, 4970K, 32 GB RAM, and then put that into a new case and migrated my hard drives over onto the new motherboard. Obviously, I re-installed Windows and re-installing all of the software is slowly driving me mad, however, not installing so much stuff is being a help. NVIDIA have just announced new Quadro cards, so I may very well acquire the Quadro K4200 sometime in the new year. While I am on the subject of the new cards, Develop3d put this rather good review out. 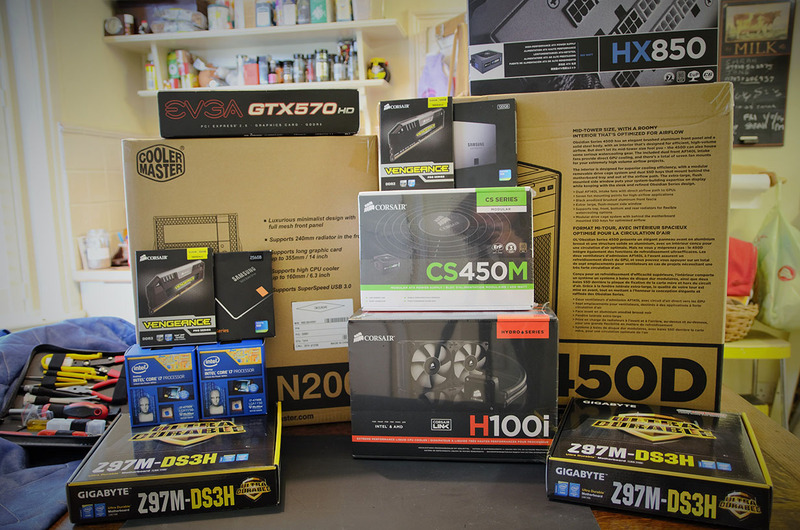 For the render nodes, I used the same motherboard as the main PC, the same CPU, 16GB RAM and a 120GB Samsung EVO SSD drive, a 80 PLUS Gold 450 PSU from Corsair and a cheap Cooler Master N200 case. I built 2 nodes, and have most of the parts for the third – bar the CPU and PSU, but due to cash flow I am choosing to hold fire on getting the third one together. I built the main PC on the same motherboard and CPU as the nodes as when I build a decent workstation, *ahem* dual Xeons, I shall turn the current PC into another node and it should mesh together with the other nodes as they are all mostly similar (except for the RAM). I don’t have any render time comparisons as of yet – but hopefully soon I will and I shall post them up, unfortunately I don’t have any times to compare against my old 2600K to see if the whole process has been worthwhile!